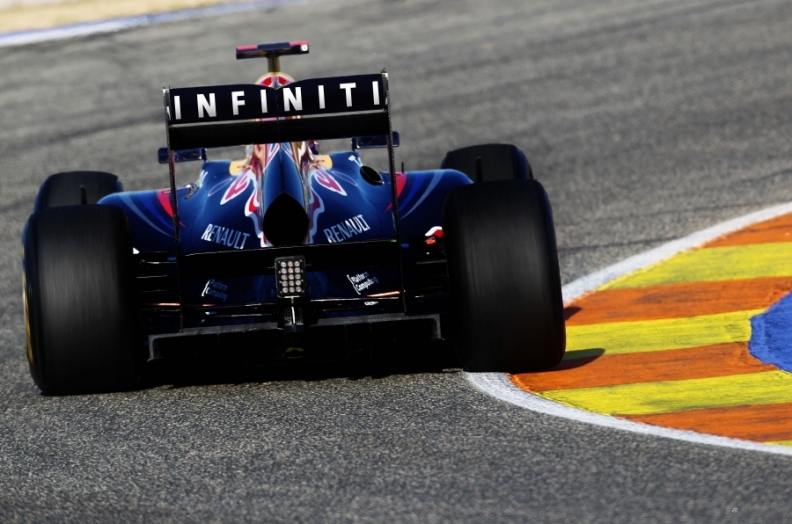 The Infiniti name will appear on nose cones, sides and the rear wings of Red Bull's F1 racecars. GENEVA -- Infiniti expects a new deal with Formula One's reigning champion to boost the brand's name recognition in Europe. "One of the big barriers we face is a lack of awareness," Infiniti Europe Vice President Jim Wright told Automotive News Europe in an interview at the auto show here last week. "So we hope that Formula One, at least for our business in western Europe, will turbo charge our levels of awareness." Infiniti, which is Nissan Motor Co.'s luxury brand, has a marketing agreement with the Red Bull F1 team that covers the 2011 and 2012 seasons. As part of deal, the Infiniti name will appear on nose cones, sides and the rear wings of the Red Bull racecars. The logo also will be on the helmets and jumpsuits worn by Red Bull's drivers. The team, which won the constructors' championship in 2010, is led by Sebastian Vettel, who won the drivers' championship last year. At 23, he was the youngest driver to ever take the F1 title. "To have the world champion driver is cool," Wright said. "It's really, really cool." Infiniti launched in western Europe in 2008 and expects to finish with 4,500 sales in the region for its 2010 fiscal year that ends March 31.By comparison, European premium sales leader Audi ended the 2010 calendar year with a volume of 623,536 units, according to industry association ACEA. Infiniti's closest luxury competitor is Toyota Motor Corp. premium brand Lexus, which debuted in Europe in 1990 and sold 17,857 units in Europe in 2010, ACEA's data shows. "If you think how long Lexus has been selling cars in Europe and you look at the relative levels of awareness of premium brands it's very sobering," Wright said. "You see how long it takes to generate awareness through conventional media." Infiniti says its brand's so-called "prompted awareness" figure rose to 40 percent in Europe last year from 34 percent in late 2008, according to its own research. Prompted awareness is measured by getting a positive response when a person is asked whether he or she knows a brand. By comparison, BMW's prompted awareness was 90 percent in 2010 followed by Audi (89 percent), Mercedes-Benz (88 percent) and Lexus (77 percent). "If you look at the Germans, they are near 100 percent," Wright said. "It takes many, many years of conventional media to do this. So hopefully Formula One will give us a shortcut to that." Infiniti also measured so-called "unprompted awareness," which is when people are asked to name the luxury brands they know without any help. BMW led in 2010 with a 65 percent rate of awareness followed by Audi (62 percent), Mercedes-Benz (57 percent) and Lexus (13 percent). Infiniti's score rose to 3 percent last year from 1 percent in late 2008. Due to F1's global reach, Infiniti expects its participation in the race series to help as it launches the brand this year in Singapore and Indonesia and as it builds up its presence in Russia and the Middle East. "There are hundreds of million of people watching in these markets and western Europe every weekend," Wright said. "From an awareness perspective, this is fantastic."